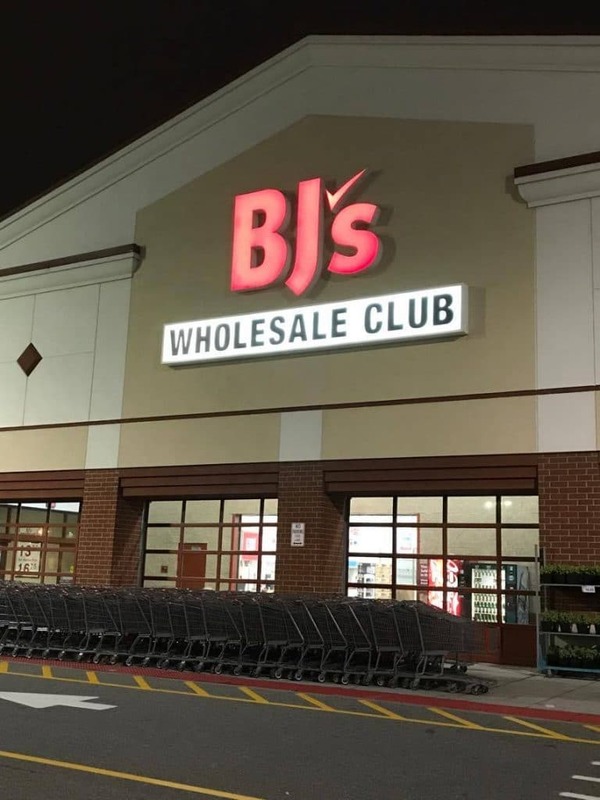 This post is sponsored by BJ’s Wholesale. 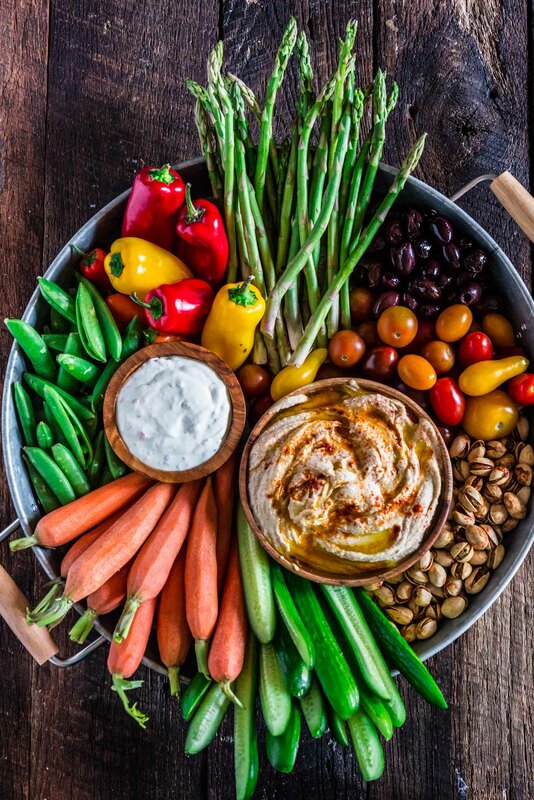 Learn how to set up a Crudité Platter that your guests will actually enjoy, filled with fresh and seasonal veggies and a few delicious dips, olives and nuts. 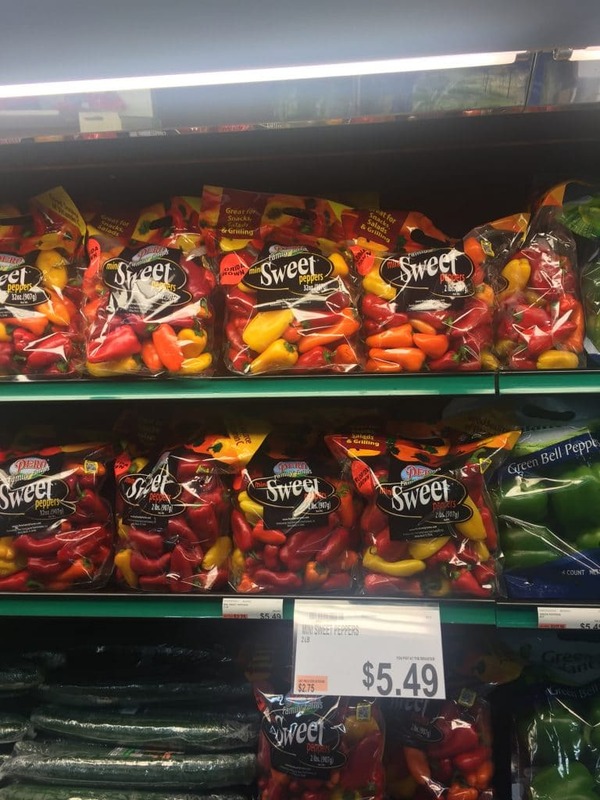 Follow this quick guide and I guarantee you will find even the pickiest of eaters hanging around this awesome vegetable tray! Crudité platters remind me of warm sunny days by the pool! Back in Brazil, my aunt would always set up some veggies (usually carrots and celery) along with some sea salt for some healthy snacking for when we needed a munch while sun bathing or swimming. Well, as years went by and I became more of a foodie, I decided carrots and celery weren’t enough and wanted to take the whole crudité thing up a notch. I do not have a pool – bummer! – so my veggie platter creations usually go with me to picnics and barbecues in the park or even just set up as a snack tray whenever I decide to spend an afternoon reading in the balcony while sipping some iced tea. With almost no effort, you can set up a beautiful healthy party platter that won’t break the bank and will be just as interesting as the popular chips and salsa that everybody goes for, if not more! ? They are the star of the show, after all. And with the whole farmers market trend going strong nowadays, you can get some beautiful spring and summer produce that look fresh, crisp and perfect for your crudité platter. Although there are usually a few guys that always make their way into my platter, like carrots, I do not have a shopping list. I choose what’s looking good and what’s in season. I also make sure I pick a variety of different flavors, forms, textures and colors so the veggie tray is not only delicious but also a feast for the eyes. That being said, I can easily get carried away and things can get pretty expensive! Especially when I see those rare imported veggies that make my heart skip a beat with excitement. But the truth is you can set up a pretty awesome crudité platter on a budget. It’s been about a year since me and Tim joined BJ’s and it’s a great way to save some money, especially when you need to feed a crowd. They have a great selection of produce, meat and dairy and you can get your meat cut to your specifications. Their butchers will gladly recut and repackaged something for you at no additional cost! 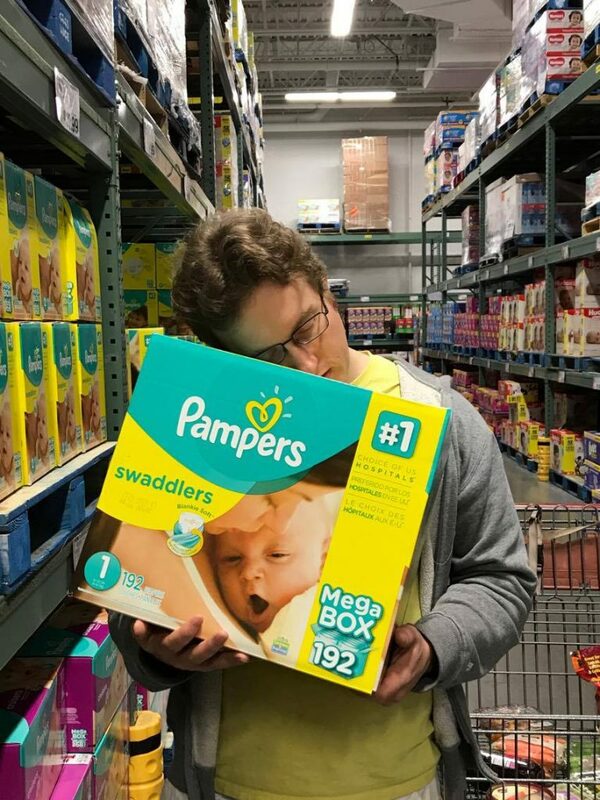 Also, now that we are expecting, we’ve been stocking up on diapers since I heard that’s going to be most of our expenses with a newborn. As you can see, Tim is already mentally preparing for the months of no sleep ahead of him! ??? If you’re not a BJ’s member yet and is interested in trying out, BJ’s is giving my readers a FREE 3 month trial membership. How awesome is that? If you’re interested, just click here to set it up and enjoy! 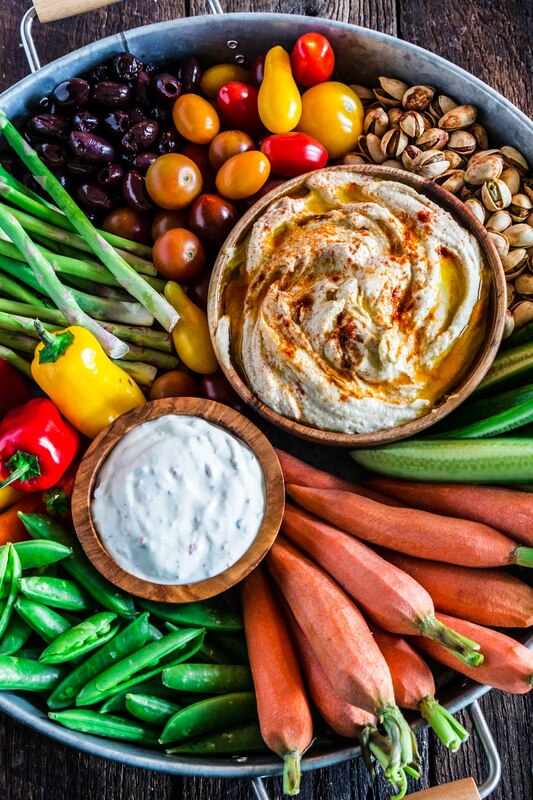 Another great tip regarding the veggies is to ideally go shopping the day you plan on assembling the platter, or the day before at the latest, so everything stays nice and crispy. Especially if you’re serving them raw. Now, although I do put some effort into choosing rustic and colorful veggies that make the platter enticing, I usually go the easy raw route. I will blanch some of the veggies so they are softer, like asparagus for example, but I don’t do the fried or roasted veggies that I’ve seen in some parties lately. Don’t get me wrong, I do think they are delicious and I can never resist those fried tempuras or the caramelized brussels sprouts. But have you met me? Or better yet, have you met pregnant me? Easy, fast and furious is my motto! So apart from some rare occasions when I decide to get fancy, I will advocate for effortless any day! ? The usual suspects: carrots (go for rustic instead of boring baby carrots, please! ), cucumbers, celery, tomatoes, broccoli, cauliflower, zucchini, bell peppers. Getting interesting: asparagus, artichokes, green beans, radicchio, purple carrots, snap or snow peas, radishes, broccolini, parsnips, fennel. Exotic: watermelon radishes, fiddleheads, jicama, endive, kohlrabi, purple cauliflower. The sky is the limit, really! 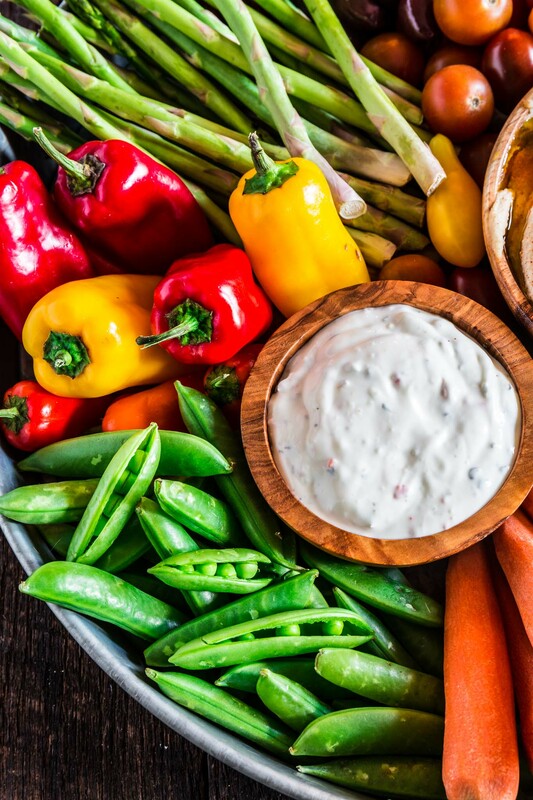 Choose your dips based on what vegetables you’ve picked. 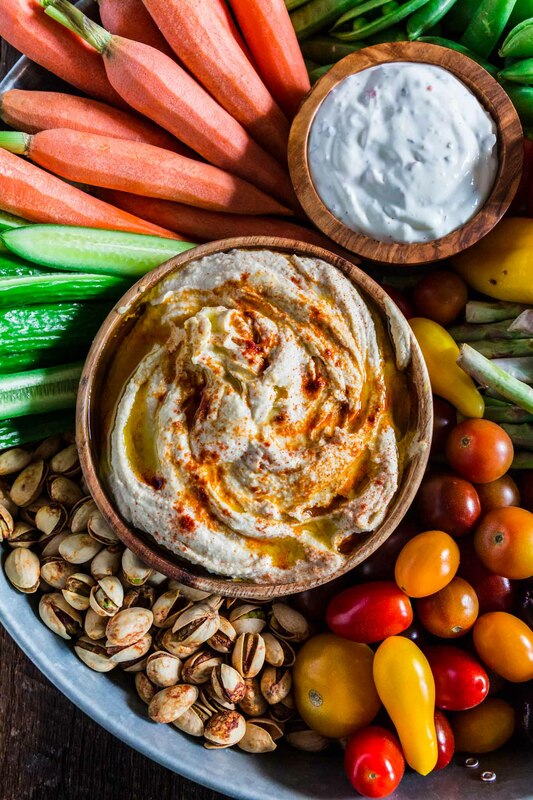 Ranch and hummus are the obvious choice, but there are so many interesting options out there, like Blue Cheese, French Onion, Roasted Garlic Aioli, Roasted Red Pepper, Baba Ghanoush, Pesto. If I have time, I like to make them myself as nothing beats a nice homemade dip. But don’t feel ashamed if you’re in a hurry and need to go the store bought route. Just make sure you get good quality yummy products! Make sure to get/make at least two, as variety is key. I also recommend having a vegan option, especially if you don’t know all the dietary restrictions of your crowd. And, although I forgot to add one for the photos, to honor my childhood crudité platter, I always add a little bowl of sea salt. ? A traditional crudité platter consists of veggies and some dips. That doesn’t mean you can get creative and add some other fun food to make things even more interesting! Kalamata olives, spicy nuts, marinated mozzarella are just a few of the sea of options that are out there for you to choose. They are also great to fill those empty spaces after you’ve assembled all the veggies and dips. And, depending on the size of your party, you might just get away with the crudité platter instead of also assembling a cheese platter and some nuts/olive bowls. Now that you have your fresh veggies, dips and other add-ons, it’s time to put it all together. We’ve already established that a good crudité platter is enticing to the eyes, otherwise it will surely remain forgotten and we do not want that, especially after thinking so carefully about all the details. Start by choosing a platter or board. A beautiful platter, a wood or marble board or even a rustic aluminium tray (great for outdoor parties), like the one I used here, all work. Size will depend on how many veggies/dips you have! The surface should look bountiful, showcasing everything the season has to offer! So make sure you pick something that can be overflowing with beautiful produce. I like to place the dips in the center and then fill the platter with veggies, being mindful about the colors and shapes. It’s like the platter is your canvas and you are Michelangelo creating a masterpiece. Just have fun with it! Wash, slice and cook your veggies according to preference. Arrange vegetables, dip and sea salt bowls and add ons on a gorgeous platter. Thanks got the tips! 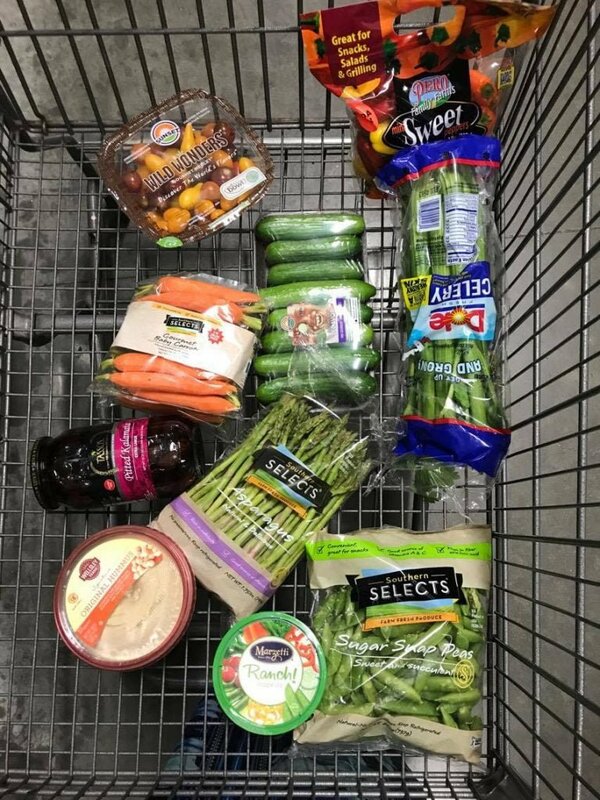 I’m getting ready for my daughter’s birthday and was looking for crudite inspiration and found your post. Hi! Im intrigued by the sea salt dish. When you were little, did you just sprinkle a little on your carrots & celery? Hi I was just wondering where you got the great metal tray? It’s from Better homes and garden! I think I got it at Walmart, many years ago.